In The Netherlands snow skates are not much seen because lasting snow periods are seldom. Most of the skates shown here therefore come from abroad where snowy winters are more common. Since not much is known about their use The virtual ice Skates museum would appreciate to receive any information that can extend the information given on this page. 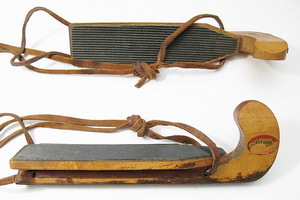 These snow skates look a bit like ski's. But because the runners are rather small they do not seem very suitably for fresh snow. They are fastened under boots like ordinary skates. Their size seem to make them fit for grown-ups. Their looks are as if they have been made in a serial production system. These snow skates look very much like ordinary ice skates. They have been made completely from wood and have been provided with a hollow bent metal strip (detail 2c). On the platforms is a profiled rubber layer to avoid slipping off. The binding is interesting as there are three holes in the platforms through which one leather lace of 1.75 m is lead. 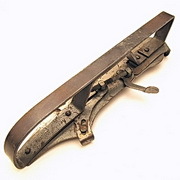 At the rear are two holes as to make it possible to make the skates suitable for smaller and bigger feet (detail 2d). The lace is brought in from the rear leaving a large loop that is used as heel strap. A toe strap is formed by making a knot in both lace ends at the front. The skates seem to be intended for women and/or children. 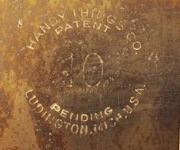 Handy Things was an American metalworking company making all kind of domestic (kitchen) tools. The snow skates must have been a seasonal product. 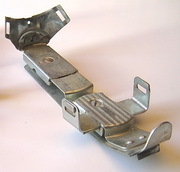 They have a clamping system for fastening them fore and aft by means of actuating just one handle (detail 3a). These skates are very sturdy which seems to be their greatest disadvantage as well: they are heavy as lead. 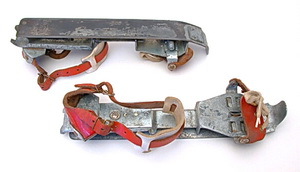 These snow skates have been made in the well-known German skates factory of Hudora. Hudora specialized in all-metal ice skates. The snow skates can be adjusted lengthwise by means of moving the rear piece. 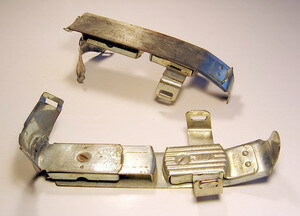 Straps can be lead through the rising pieces to fasten the skates to the boots (detail 4a en 4 b). Interesting is the cross strip at the front bottom that acts as a brake (detail 4c). Another pair of snow skates. It is likely that they have been made in Germany as well. 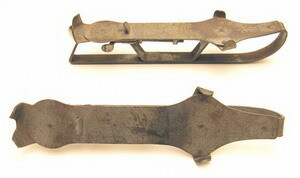 With these skates both the front and the rear part of the skates may be adjusted.